Note: Photos shows scarf unblocked. I still haven't gotten around to finding some rust-proof pins for blocking. 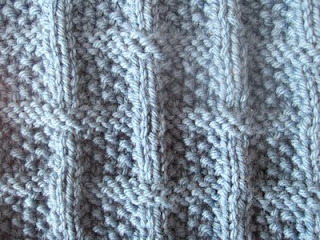 The stitch pattern in BW2 is given in row-by-row instructions. I translated this into a chart and used this to create it. The chart below is not for the scarf you see here; I created the chart a long time ago back when I was knitting the scarf with a different lighter/thinner yarn. So this chart is designed for a 54 stitch wide scarf, not the 40 stitch wide scarf you see in the photos. 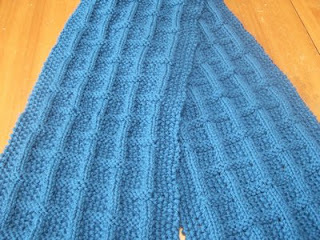 The chart also shows 6 rows of top/bottom seed stitch border instead of the 7 rows you see in the scarf above. Both versions have a 5-stitch seed stitch side border; I chose 5 stitches to match the 5-stitch wide seed stitch squares in the main pattern. I'm leaving this chart here for anyone who is interested, and I plan on re-doing a new chart for the 40 stitch wide scarf when I have more free time. 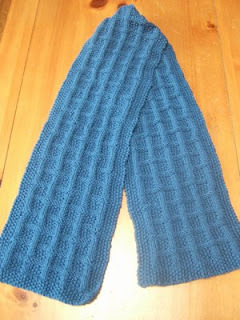 This scarf was knit in Elann's Superwash Merino DK, 4 balls. My unblocked scarf is 8.5 inches wide and 5 feet long. I used most of the 4th ball, so a 5th ball would be needed for a much longer scarf. This yarn is pretty soft for a machine washable yarn. I think the softness varies between the colors. 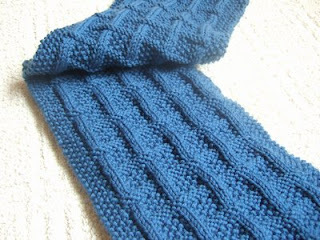 The Capri Blue color which I used in my Bernadette Scarf was the softest. Then it's a toss up between the Tapestry Blue color I used in this Winterbourne Scarf and the Regency Rose color I used for my Regina Scarf. I have a few more other colors of this yarn, it will be interesting to see how soft those ones are. I know, my last 3 scarves were knit in the same yarn, Elann Superwash Merino. You might even start to suspect I'm in a yarn rut. But I must tell you that this is not completely true. I originally started this scarf with some Elann Baby Cashmere fingerling weight yarn (also in Tapestry Blue color) in an attempt to find a non-lace application for this specific yarn (which I have tons of). I worked it up a bit and did not like the results. I have tons of Baby Cashmere and I'm afraid I will have to use it for lace-only applications. I think this pattern would make a lovely baby blanket. I can imagine knitting one, however I am smart enough to know I should not start any big projects like that since I am still not finished with the baby blanket I started over 2 years ago; I've added about 5 to 6 rows since the photo here. Winterbourne Scarf pattern is given below in row-by-row instructions; this is the 40-stitch scarf you see in the photos. There are two chart links below, one for the wider 54-stitch scarf (the scarf I started out with but never completed because I didn't like how it worked up in the yarn I used) and the other for the 40-stitch scarf (the scarf you see in the photos). 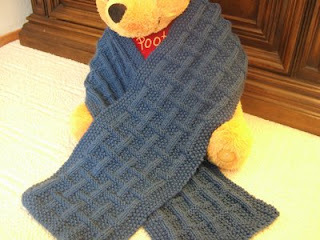 Click here to download 40-stitch wide Winterbourne Scarf Chart. Click here to download 54-stitch wide Winterbourne Scarf Chart. Even numbered rows are RS rows, they are read from right-to-left. Odd numbered rows are WS rows, they are read from left-to-right. Blank squares mean Knit on RS rows, Purl on WS rows. Dot squares mean Purl on RS rows, Knit on WS rows. Cast on 40 stitches. Work rows 1 to 7. Repeat rows 8 to 25 for pattern, knit until desired length, ending with row 23. Then work rows 26 to 32. Odd numbered rows are RS rows, they are read from right-to-left. Even numbered rows are WS rows, they are read from left-to-right. Cast on 54 stitches. Work rows 1 to 6. Repeat rows 7 to 24 for pattern, knit until desired length, ending with row 22. Then work rows 25 to 30. This is beautiful! I love seed stitch too, even though it's a pain to knit! I just finished this one - took a bit longer than I thought with all the seed stitch. I used caron simply soft and it made a beautiful wide scarf. Thanks for all the gorgeous patterns! Just beautiful. I've been looking for a scarf pattern for my father-in-law. May I ask what size needle did you use?